Wayne County is the location of the famous city of Detroit – the motor city. Wayne County is home to some world renowned scientists who have contributed greatly to cerebral palsy research. A Detroit scientist from Wayne State University / Detroit Medical Center helped prove that when a baby’s brain is cooled shortly after an injury caused by oxygen deprivation, the cooling can help prevent cerebral palsy and death. A different group of scientists from the same institutions have found a way to improve movement disorders (such as those seen in cerebral palsy) in rabbits by delivering medicine to very specific parts of the brain using nanotechnology. This research is extremely promising for the development of medications to help prevent or decrease the severity of cerebral palsy. The tri-county area has many top-notch hospitals and medical centers. These centers are home to some of the best medical professionals in the world. With such a high level of talent, it’s hard to imagine that patients would ever receive substandard care. Unfortunately, however, even the best physicians in the world make mistakes and sometimes cause permanent damage to patients. As unfortunate as this may be, it’s heartbreaking when the patient is a newborn baby. If you live in Wayne County, Oakland County, or Macomb County and you believe your child has been a victim of a birth injury due to medical mistakes, Reiter & Walsh ABC Law Centers can help. Our award-winning birth injury attorneys will review your child’s case for free, determine when and where negligence occurred and fight for the compensation your child needs for a secure future. The award-winning birth injury attorneys at Reiter & Walsh have helped hundreds of children affected by hypoxic ischemic encephalopathy and cerebral palsy. 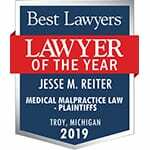 Jesse Reiter, president of ABC Law Centers, has been focusing solely on birth injury cases for over 28 years, and most of his cases involve hypoxic ischemic encephalopathy (HIE) and cerebral palsy. Partners Jesse Reiter and Rebecca Walsh are currently recognized as being two of the best medical malpractice lawyers in America by U.S. News and World Report 2015, which also recognized ABC Law Centers as one of the best medical malpractice law firms in the nation. If your child experienced a birth injury and now has seizures, HIE, brain damage, cerebral palsy or any other long-term condition, contact Reiter & Walsh today at 888-419-2229. Our Wayne County, Oakland County and Macomb County birth injury attorneys are available 24/7 to speak with you. Cerebral palsy: this is the most commonly known form of physical disability. It is a disorder due to brain damage that impairs muscular function and causes weakness in the limbs. It typically occurs from lack of oxygen to the brain right after birth, brain injury during labor and delivery, or from infection. Erb’s palsy: also known as brachial plexus palsy, this condition is caused by an injury to the brachial plexus, a group of nerves around the shoulder. Sometimes this will resolve on its own or through therapy and/or surgery; other times the damage is permanent. Intellectual and developmental disabilities: This condition is usually diagnosed before the age of 18 and involves below-average general intellectual function, and a lack of skills necessary for daily living. There are varying degrees from mild to severe. Cognitive problems: Also known as cognitive deficits or dysfunction, these involve difficulties processing information, including mental tasks such as attention, thinking, and memory. Learning disabilities. Learning disabilities affect the brain’s ability to receive, process, or store information. These problems can make it difficult for someone to learn as quickly as another who isn’t affected by learning disabilities. If your child was diagnosed with a permanent disability such as cerebral palsy, HIE, intellectual and developmental disabilities, periventricular leukomalacia (PVL) or Erb’s palsy, Jesse and his award winning team can help. The Wayne County, Oakland County and Macomb County birth injury attorneys at Reiter & Walsh have helped many families throughout the country obtain compensation for lifelong treatment, therapy and a secure future. The firm has numerous multimillion dollar verdicts and settlements that attest to its dedication and success. Email or call Reiter & Walsh ABC Law Centers at 888-419-2229 for a free case evaluation. No fees are ever collected until we win your case.